click: Place 1 power counter on IT Department. Hosted power counter: Choose a rezzed piece of ice. That ice has +1 strength until the end of the turn for each power counter (including the one spent) on IT Department. IT Department always gives a piece of ice +1 strength due to the token spent to activate the card ability, even if there are no other counters left on the card or IT Department is no longer installed. This card is truly balanced masterpiece with careful non-confusing wording. While it may seem overpowered at first glance fear not, as it was carefully tested (probably by the same testing team that suggested lowering Corroder influence) before printing. If you are thinking about building deck with this card then you should probably think again because this card does almost nothing and you have to waste clicks for it to even work! Imagine this situation: during the game you clicked this card let's say... 15 times. Now when runner breaks the Tollbooth and Archer that are protecting this card (it would cost mere 50 credits, which runner can easily get when you are busy clicking this useless piece of cardboard) he can trash it for 4 credits and 1 click! Clearly this is really ineffective usage of your clicks and you shouldn't really play this card. When somebody complains that this card is too powerful it's probably because they are playing non-efficient breakers such as Corroder or ZU.13 Key Master or maybe they are not using the time you are giving them (when wasting your clicks on this really under-performing card) to put pressure on you by breaking your ice for 20 credits each. - it only adds strength to rezzed ice. Despite it's many obvious flaws maybe some kitchen table players find it fun. IT Department is one of the more controversial cards in the game as I write this. It's complicated, because a lot of people misread it and don't know how to respond when they first see it. It creates a persistent modifier until the end of turn that looks back to IT department. That is, it will give X+1 strength (for each use) to a target ice until end of turn, where X is the current number of counters on IT department. The strength of an Ice is S+n(X+1), where S is the ice's strength, n is the number of times you've used IT department to buff that ice this turn, and X is the number of power counters currently on IT department. Now that that's out of the way, the card is amazing at creating a glacial lock. Think of it as the Scorched Earth, or San San City Grid of HB. If you let it sit on the table it will end the game by making it impossible to get into any server. Like any other must-respond to card you have to take it down as soon as you see it or risk losing the game. This is another reason beyond NAPD that your runner decks have to be able to afford to spend 4 creds when they get into a remote. Commonly paired with caprice & ash this card can be hard to get to, but not impossible if you're expecting it. You'd normally have a way to get to an agenda being protected by one of those other cards, and this is no different. It may mean considering the oddball card like blackmail, quest complete, or Singularity that you wouldn't have even considered in the past. Now as much as I've said there are ways to deal with this (especially in the first two turns that it's on the board), that's not always the case. Stealth credits can help you get there by taking the teeth out of of sentries and preserving your actual credits for trashing, but there are games where this card will get up and running, lock the runner out of the game and cause a win. 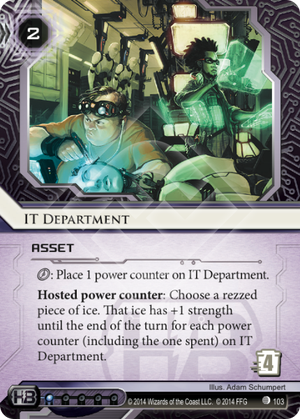 Cards you should be considering in the Age of IT Department are probably cards you're already considering: femme, d4v1d, inside job, planned assault, emergency shutdown, etc. 3 = 3, 4, 3. 4 = 4, 6, 6, 4. 5 = 5, 8, 9, 8, 5. 6 = 6, 10, 12, 12, 10, 6. 7 = 7, 12, 15, 16, 15, 12, 7. 8 = 8, 14, 18, 20, 20, 18, 14, 8. 9 = 9, 16, 21, 24, 25, 24, 21, 16, 9. 10 = 10, 18, 24, 28, 30, 30, 28, 24, 18, 10. 11 = 11, 20, 27, 32, 35, 36, 35, 32, 27, 20, 11. 12 = 12, 22, 30, 36, 40, 42, 42, 40, 36, 30, 22, 12. I won't go into details what this card does. Everyone knows if they find it strong, or nots. I will simply give you a very easy way to calculate correctly the bonus strength the ICE gets after using X number of counters. So you choose a piece of ice, and it gains a relationship with IT department that let's the ice gain strength for each power counter on it. You can only effectively use it once per piece of ice per turn, and as such, it's hard to find room for a card that only seems to counter decks that include cards like Atman as a replacement for a sentry, and stealth to a point. Face any decent pump able breaker, and you basically have a reversed accounts that you briefly taunt the runner with, before he uses some trick to deny you the paltry amount of counters you could accumulate with it. Meh, meh, and meh. Still has a decent trash cost, and the rez isn't horrible, but its not as good as you think it is, so its not really good is it?